Google’s new social network, Google+, has added a much needed capability to its businesses pages: multiple administrators. This feature functions similarly to Facebook Pages in that it allows a business to have more than one “manager” — to use Google’s term — who can update its Google+ page. Assuming you have already created a Google+ business page, use the steps that follow to add other administrators. If you haven’t created that page, see “How to Create a Google+ Business Page,” my previous article on that topic. Step 1. Log into your Google+ business page by clicking the grey icon located under your profile name and in the left-hand column, then click on the page name. Start by selecting your Google+ business page. 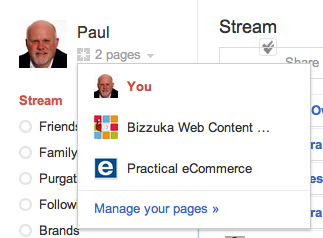 Locate the "Settings" button in the "Stream" section of your Google+ business page. Step 3. Click the blue “Settings” link located in the upper right-hand corner — see the red arrow in the above screen shot. Step 4. Click the “Managers” link located in the left-hand column. Click "Managers" to add other administrators. Step 5. Add the email address of the new administrator and click the “Invite” button. Page owners can send an email invitation to new administrators. You will then see a pop-up window confirming that you want to add the person as an administrator. He or shee will receive an email containing the invitation, and can click a link to accept. Once the invitation has been accepted, the new administrator can then access the business page via his or her own Google+ account. Note that while email invitations can be sent to any address, the person must have a Google+ account to be an administrator. 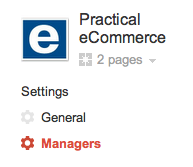 According to Google, business pages can have two types of administrators: owners and managers. Each page can have only one owner, but can have up to 50 managers. All managers have the same administrative permissions. As the screen shot below shows, they can: Invite other managers, remove managers, view the manager roster, view and adjust page settings, and take actions such as post content on the page. Page owners and managers have different administrative permission levels.. The benefit to the business owner to multiple administrators is that it removes him or her from sole responsibility for managing the page. However, clear guidelines need to be put in place — I addressed these in “7 Keys to Managing Online Communities” — to maintain integrity and ensure only content that the owner deems acceptable gets posted.